With a passion for speed, we put our products on cars that compete at the highest levels under the toughest conditions with a will to win and the technology to outlast. For 2014 Rayno is proud to hold sponsorship relations with Formula Drift Driver Joon Maeng and his 1,100 horsepower tire slaying race car. 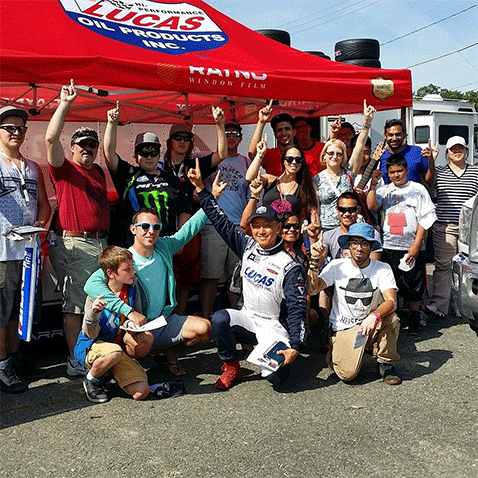 We have a passion for racing and the Formula Drift series is perfect proving ground for Rayno products. Rayno met Joon at the SEMA show in 2013 and we knew immediately that the partnership would be a positive one. Over the last year Joon has played an integral part of building the Rayno name by being a positive role model and brand ambassador for Team Rayno. Before the beginning of the 2014 Formula Drift Season, Rayno flew one of America’s best tinters out to California to apply our Phantom film to Joons race car, which we found to be a perfect opportunity to show the world just how durable our film is. Throughout the entire season Joons car has utilized the same window pieces and what we found was that not only did the film keep the inside of the car cooler under race temperatures, but when put to the ultimate test of a crash during the race in Long Beach the film held strong with barely any sign that the car had ever touched the wall, much less obliterate it. As the season draws to a close this October we’re excited to celebrate our passion for motorsports and we look to the future for many new opportunities to come. Joon Woo Maeng was born in Seoul, Korea and moved to the United States at the age of nine. His passion for speed and cars began early in his childhood. Since then, he has remained loyal to his passion through drifting. As a matter of fact, Joon’s favorite moments are when he is on the track honing his drifting skills. In addition to motorsports (or driving or drifting), Joon is well known for his positive attitude. He strives to be a good example by sharing words of encouragement and lending a helping hand to his friends and neighbors on and off the track. Giving, sharing, and living in hope not only provides him with a sense of fortitude, but also keeps him grounded. With an unquestionable dedication to the sport, Joon Woo has proven himself a worthy competitor. His attitude and exemplary work-ethic have won over the hearts of both fans and fellow competitors. Joon desires and is determined to work as part of a team and will do his best to underscore the reputation of his sponsors’ name and integrity.